Your body is constantly being bombarded with toxins from foods, preservatives, medications and your environment. You are forever breathing in fumes and frequently touching metals that can be absorbed into your body through your skin. In fact there have been over 80, 000 new chemicals produced since World War 2 and your body is constantly working hard to eliminate those! Within the Chinese Medicine calendar the best time to clean is Spring, this timing correlates with the Liver Energy. The liver is a major cleanser of your blood it also helps to balance your hormones. During Autumn, you can refresh your internal body again. This timing correlates with Lung Energy and this is a time when your lung is at it’s lowest energy. Taking time to detox your body gives you and your lungs a good chance to create a healthier base before taking on the colder, Winter months. This includes releasing airborne chemicals or metals that have been absorbed into your body throughout the year. Don’t worry if you find you haven’t completed a body cleanse during either of these seasons, whilst Autumn and Spring are preferable times in Chinese Medicine, you can complete one anytime to help you be healthy, re-energised and happy. At Banksia Women’s Healing we run personalised 2 or 4 week detox programs to help you cleanse and reenergise your body. 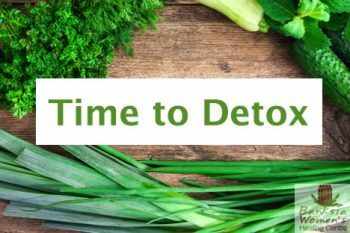 Depending on your current health your detox program can include an ION cleanse, massage or lymphatic drainage and a range of Chinese Medicines and herbal remedies. Contact the clinic on Ph: (07) 3351 4691 to book in or find out more.